The user communities for high energy x-ray capabilities at the A2 and F2 stations have grown considerably in the past few years, easily saturating the beamtime available for powder diffraction, high-dynamic range and high resolution studies at A2 and multiple load-frame structural materials experiments at F2. In addition, this past year the A2 station was upgraded to deliver filtered white beam from its undulator; early feasibility work doing fast time-resolved Laue and energy-dispersive diffraction was very successful. With additional demand on A2, the time came to ask if the A1 station could be reconfigured to deliver x-rays energies above 19.5 keV. The answer was a resounding "yes," followed by careful thought before committing to design and commission a new type of x-ray monochromator for the undulator beam on A1. Intercepting the undulator beam only 15 meters from the source, the only crystal optics that could survive very high heat loads are semi-transparent and high thermal conductivity diamond. Previously, A1 had a single (111) diamond crystal using a horizontal deflection geometry to provide 19.5 keV photons. To deliver higher energies into the hutch, our engineering staff, with Tom Krawczyk as the project lead, designed a water-cooled crystal mount to hold multiple crystals (figure 1). The (111) crystal diffracts a beam with center energy of 19.5 keV, and a separate (220) crystal diffracts a beam with center energy of 32 keV. In practice, switching energies requires only moving the copper block horizontally. The next phase of development will add a third crystal to produce a 45 keV beam using the (004) reflection. Schematic of the new x-ray monochromator for the A1 station. 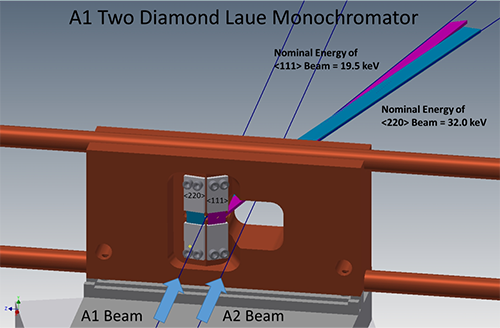 At right, the A2 undulator beam passes through the water-cooled copper block while the A1 undulator beam strikes one of two diamond crystals. Moving the block horizontally brings either the (220) or (111) diamond crystal into the A1 undulator beam to provide 32.0 keV or 19.5 keV x-rays to the A1 hutch, respectively. Though different in design, the idea for a movable water-cooled block with multiple crystals follows a successful stacked optic at beamline ID15C at the European Synchrotron Radiation Facility. To test the capabilities of A1 in a variety of experimental modes, the layout of optical tables and ancillary equipment inside the A1 hutch was reconfigured by Chris Conolly and the operations group. (The changes were made so that the protein crystallography setup of the MacCHESS group can be quickly returned to use.) Scientist Jacob Ruff helped commission the two new diamond crystals, resulting in a command-line switch from 19.5 to 32 keV in 5 seconds. He tried using two Dexela high-energy x-ray area detectors to record powder diffraction data, and succeeded in recording calibration images at both energies using only 50 millisecond exposures (figure 2). Later, Zhongwu Wang, Ruipeng Li and Qingqui Huang successfully recorded diffraction data from a protein crystal under pressure inside a diamond-anvil cell (figure 3). And Xin Huang, graduate student with Joel Brock, recorded diffraction data from sulfur compounds inside a battery during charge-discharge cycling. In all these test cases, the intensity, stability and geometry of the x-ray beams in the A1 hutch were well suited to the measurements at hand. 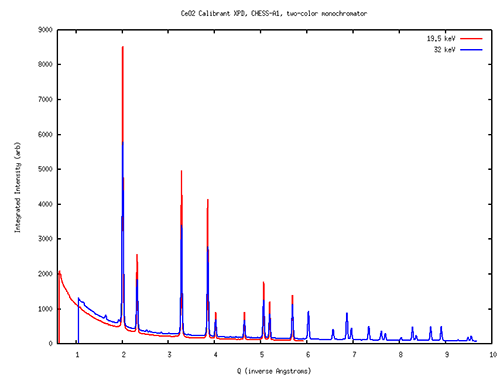 Powder diffraction scans of cerium oxide collected using the two-color monochromators at the A1 station at 19.5 and 32 keV. Both spectra taken with 50 millisecond exposures using Dexela area detectors. Upcoming feasibility work includes Richard Gillilan and Jesse Hopkins testing BioSAXS data quality and harmonic rejection at 19.5 and 32 keV, tests of X-ray Fluorescence imaging at the higher energy, and combined phase contrast imaging with simultaneous x-ray diffraction at both energies. Users of any of the x-ray techniques mentioned above are invited to speak with staff members and encouraged to submit proposals and beamtime requests to try experiments at the newly upgraded A1. 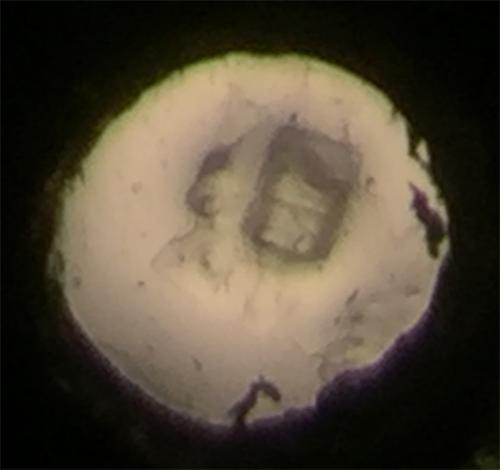 50 micron protein crystal photographed inside a 200 micron opening of a gasket of a diamond anvil cell.